Duration Pricing allows cores to reduce pricing for users on longer running reservations. As users schedule time on equipment calendars, they may reach a time threshold when their reservation is eligible for the duration pricing discount. Cores may even reduce the cost to zero after a certain time for the reservation. To indicate the discount rate, the core will enter the rate for each resource, each usage type, and each price type. Note: Duration Pricing Settings can only be edited by an iLab associate. Contact Support‍ for more information or to edit the Duration Pricing Settings. The main Duration Pricing Settings are located at the core level under the Advanced Scheduling Settings on the Administration tab. Note: Duration Pricing Settings can only be edited by an iLab associate. Contact Support‍ for more information or to edit the Duration Pricing Settings. A duration price is added to a resource in the Schedule Settings. Once you have opened the schedule settings click on the Usage Type and Pricing section. You will set up the duration price per equipment, per availability, and per price type. For each availability that should receive a Duration Price you will add the price in the Duration Price column next to the normal resource price. A value of 0 is valid and will mean the use is no cost once the duration threshold is met. The field can be left with N/A to indicate that the usage type is not eligible for duration discounting. This usage might be used to determine the time towards the threshold if the "Total Reservation Time" setting is used (see above), but it will not receive a discounted rate itself. 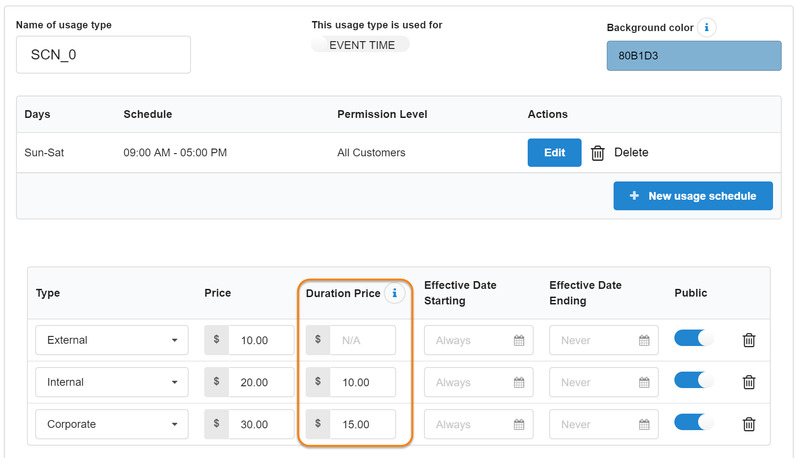 Once your Duration Prices have been set, users can now create reservations‍ eligible to receive the Duration Price discount. When a reservation crosses the duration threshold, the system knows to split the reservation and discount the hours that are above the threshold, for either the entire reservation or for the discount eligible hours as explained above in the Duration Price Settings. The next example is based on two usage types: the first is ineligible for duration pricing (i.e. Duration Price set to N/A) and the second is eligible for duration pricing after two hours. Furthermore, the duration eligibility setting is set to "Total reservation time", which means that all hours of the reservation will count towards the threshold (even for usage types that are not eligible themselves for discounted rates). As a result, the first three hours have the base rate of $20/hour applied (since the usage type is not eligible), but the hours are counted towards the eligibility threshold. In fact, the threshold is met during this usage type, and therefore next four hours under the second (eligible) usage type are all discounted at a rate of $10/hour. In the final example, the only change is that the duration eligibility setting is set to "Discount eligible hours only". As a result, the hours under the first (ineligible) usage type are no longer counting towards the threshold. This means that the count towards the threshold starts with the second usage type, which is split into two hours of undiscounted time at $20/hour, and two remaining hours at the discounted rate of $10/hour.